Play panels and Interactive play experiences provide young children with yet another way of having fun, through a learning approach that enhances their ability to observe and concentrate. 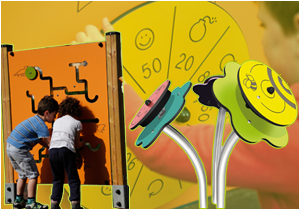 Play panels stimulate thinking, logic and concentration. Musical play activities stimulate auditory perception and develop creativity and interaction with other children. Interactive play experiences combine physical activities, intellectual activities and technology. Designed for a connected generation, these play activities interweave sound, light and action. Visual and audio stimuli call upon juniors’ cognitive functions, requiring them to use memory, recognition, speed and responsiveness.